Essentially, individual dental veneers are thin pieces of porcelain that provide a small coating or shell for the outer surface of your teeth. Dental veneers are custom made to the contour of your teeth, and during the procedure they’re actually bonded to your tooth’s enamel. They can potentially be applied to any number of teeth, and can provide a number of benefits. Being custom-made, dental veneers are expertly engineered, and designed to provide strength and resilience to your teeth, while restoring or maintaining their beautiful aesthetics. They’re often favoured by patients who suffer from chipped, worn, crooked or gapped teeth, as dental veneers are often the perfect solution to make their smile more even and symmetrical. Similarly, they’re frequently chosen by people who suffer from some sort of intrinsic staining on their teeth; the sort that can result in long-term and frequent consumption of coffee, red wine and fruit juice. 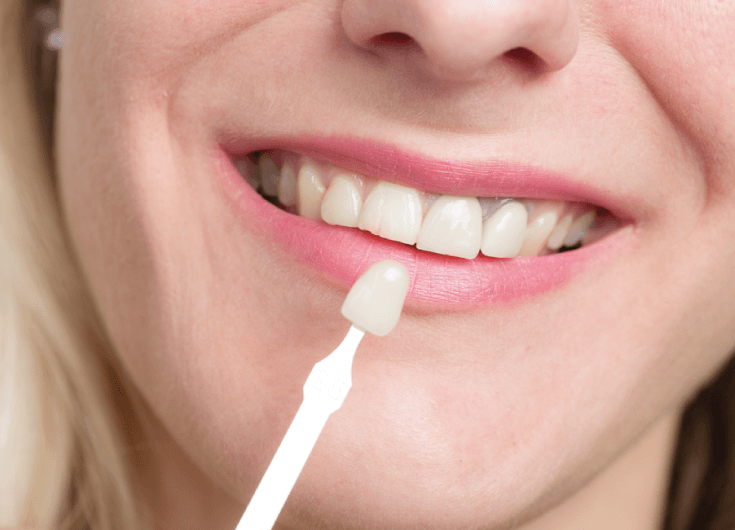 In short, not only do they provide tangible, function physical protection for your teeth, but they can also disguise unsightly discolouration and give you total confidence in your smile. What are dental veneers made out of? In most cases, dental veneers are made of porcelain. From a dentist’s point of view it’s an easy material to shape, while from a patient’s perspective it’s highly durable and resistant to staining, while doing an excellent job of mimicking natural tooth material. Alternatively, dental veneers can sometimes be made out of resin composite materials, of the same kind usually used to make white fillings. Now, with modern dental technology having advanced to the stage it’s at today, it’s almost impossible to distinguish a dental veneer from a real tooth. Today, dental veneers are without a doubt a long-term investment. With modern dentistry techniques and technology, dental veneers are known to last up to 20 years before requiring replacement, so patients can have faith in the long-lastingness and effectiveness of their treatment. Here at AP Smilecare, we understand the importance of your smile in maintaining your self-confidence, which is why we offer our smile makeover amongst our range of core dentistry treatments. We’ve got a fantastic track record of success with our patients, thanks to our expertise and experience in knowing exactly how to keep your smile looking and feeling amazing. Why not pop into our dentist’s clinic in Blackburn, or give us a call on 01254 297 000 to see what we can do for you?